Our regular business hours are from 8:00 a.m. to 10:00 p.m daily. Our San Diego main office address is 11622 El Camino Real, Suite 100, San Diego, CA 92130. Have You Given a Statement to Anyone? Our San Diego main office is located at 11622 El Camino Real, Suite 100, San Diego, CA 92130. We are centrally located in the Carmel Valley area, within 30 minutes of anywhere in San Diego County. While we do have a downtown location near the courthouse, we meet most clients in the Carmel Valley office where we offer convenient, free parking for our clients. When you call our firm, you will always talk to a lawyer. It is important to us that a lawyer speaks with you immediately. After all, if your situation was not important, you probably wouldn’t be taking the time out of your busy day to call a lawyer. Call us now to set up your free attorney consultation with a San Diego personal injury attorney, who will explain all of your legal rights and remedies. If you have a desire to do your own legal research pending your office consultation with a lawyer, visit the Knowledge Center (see below). Our Knowledge Center is an online injury law and information center that can answer many of your questions until you are able to come to our office and meet with an attorney. 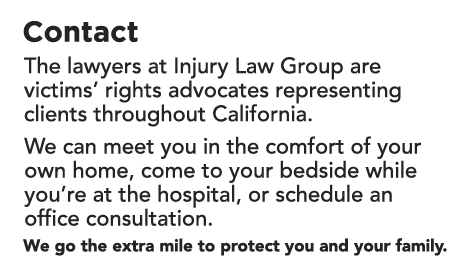 Injury Law Group is open every day from 8:00 a.m. until 10:00 p.m. Call now and speak with a personal injury attorney who will immediately take steps necessary to protect your legal rights. We will protect you and build a strong case while you and your family focus on recovery. Call now and speak directly to your lawyer.